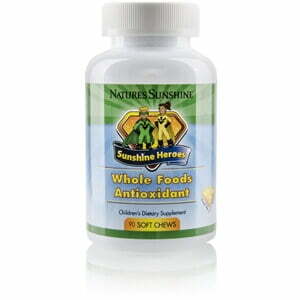 Nature’s Sunshine Sunshine Heroes Whole Foods Antioxidant ensures that children receive the benefits of more fruits and vegetables. The National Cancer Institute recommends eating at least 5 to 9 servings of fruits and vegetables per day, and kids don’t often get that. Sunshine Heroes Whole Foods Antioxidant provides the benefits of an antioxidant-rich diet, offering the equivalent of two average servings of fruits or vegetables (based on ORAC values). In addition to whole food sources of antioxidants and nutrients, Whole Foods Antioxidant soft chews provide vitamin A, vitamin E, and vitamin C for extra antioxidant protection and nutritional support.